Introduced back in 2014 as a more comfortable and amiable alternative to the racetrack-oriented CBR600RR, the global market Honda CBR650F has basically flown under the radar in the US for the most part. An all-new motorcycle designed and built in Honda’s growing Thailand factory, the CBR650F utilizes a 649cc inline-four engine with intake and exhaust tuning aimed at better low-end and midrange power. With more relaxed ergos and a much comfier seat than the CBR-RR (not to mention a $3,050 cheaper sticker price), the Honda Thailand-built 650F is intended to fill the space between the CBR500R/F models and the 782cc Interceptor. There are some significant updates to the 2018 model that boost overall performance, yet the sticker price has only increased $250, to $8,749 (the ABS model we tested tacks on another $500). For starters, power has been improved by a claimed 4 horsepower by way of reshaped intake funnels and a redesigned exhaust and muffler. The transmission ratios have been subtly revised to provide “better acceleration feel” (read: shorter gearing), and the headlights are now full LED units to match the rear (with the front cowl styling much improved by getting rid of the halogen reflective housing). The Nissin slide-pin, two-piston calipers have been updated to better components, and the air valves on the wheels are now L-shaped to provide easier access. But probably the most interesting update is the addition of the new Showa “Dual Bending Valve” 41mm conventional fork. A design first seen on the 2015 Harley-Davidson full dress touring models (Gasp! Yes, in case you didn’t know, many H-D models use Japanese-made Showa forks), the SDBV fork design is intended to provide the more linear damping characteristics of a cartridge-type fork without the additional components, weight, and cost. A conventional damping rod fork’s drawback with its orifice damping design (basically forcing oil through a hole) is that the damping rate is extremely progressive; if the suspension moves twice as fast, the damping becomes four times as stiff. This means big, sharp-edged bumps at speed won’t be absorbed very well, while aggressive braking causes the front end to dive because the fork isn’t moving quickly enough for the damping circuit to activate. The cartridge fork found on expensive supersport models solves this by using separate rebound and compression pistons, with shims instead of holes to regulate oil flow for damping force. As the oil pressure increases from a bump, the shims can bend to allow more flow; using different thicknesses and “stacking” the shims allows precise adjustment of the oil flow and a more linear damping force curve (in addition to allowing more external adjustment via needle/seat valves). But the cartridge assembly adds a lot of components and cost—and the latter Honda obviously wanted to avoid with the budget-oriented CBR650F. Showa circumvented this by creating a combination compression/rebound damping piston assembly inside the conventional fork without the expensive cartridge unit. Since the CBR650F didn’t need damping adjustability, the adjustment rods, needles, seats, and other components included with a cartridge assembly could also be deleted, allowing Showa to simplify the design. 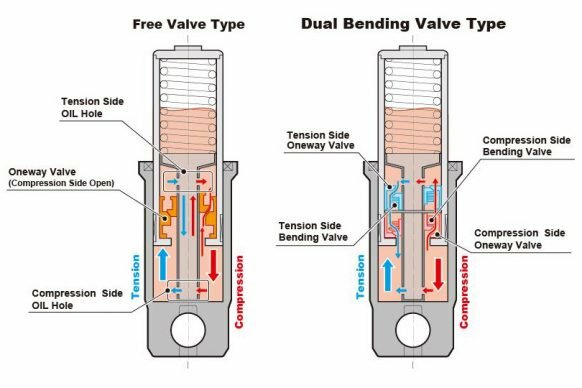 The SDBV fork basically uses a two-sided piston, with a shim on the compression side and another on the rebound side (the “dual bending valves”) to control oil flow for more precise damping control. The CBR’s cockpit is fairly roomy, with high-set clip-ons above the top triple clamp and decent legroom from the well-padded seat to the footpegs; seat height doesn’t feel overly tall, but at 31.9 inches, it’s not exactly low either. The dash is basic, with an LCD combination bar graph tachometer and digital speedometer on one side, and an LCD info panel with a fuel gauge, clock, and switchable odometer/tripmeter/mpg calculator on the other. Firing up the 649cc four reveals an exhaust note with a good growl to it, unlike most overly muffled stock exhausts. Clutch pull is nice and light, and clicking the bike into gear reveals minimal driveline lash. Taking off from a stop is easy, with a surprising amount of grunt for a middleweight inline four-cylinder. In fact, grabbing a handful of throttle at 4500 rpm reveals more acceleration than we can ever recall with this type of engine; you can actually pass cars on the highway below 7000 rpm by just twisting your wrist, with no tap-dancing on the shift lever. When’s the last time you ever heard of doing that with a 600? Nothing comes for free though, and Honda had to rob Peter to pay Paul when it came to the CBR650F’s powerband. Expecting the midrange punch to carry on into screaming top-end will leave you disappointed; the power party starts to tail off well before the 11,400-rpm redline (a surprisingly low redline number for a middleweight inline four, which should tell you something). 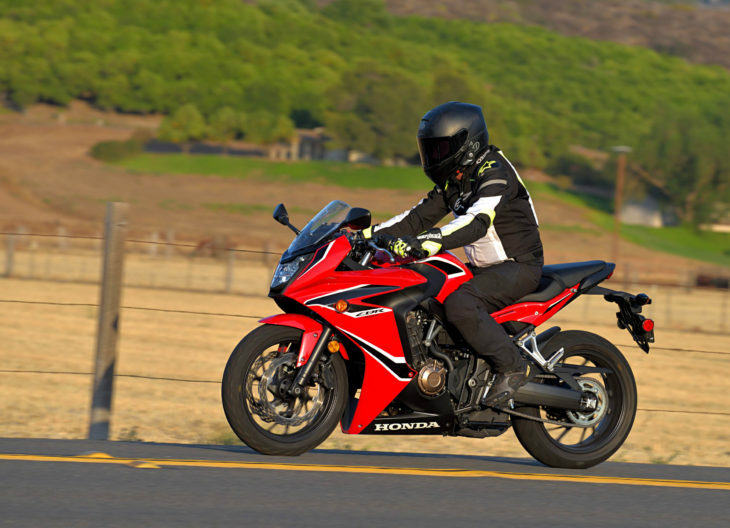 Then again, Honda didn’t intend the CBR650F to be racetrack-ready supersport bike, and the power that’s there is plentiful enough to provide good fun in both the city and the country backroads. Just remember to shift much earlier than you normally would on a 600 and it’s all good. The Honda’s handling manners are very user-friendly, with neutral steering characteristics and good stability in most situations. 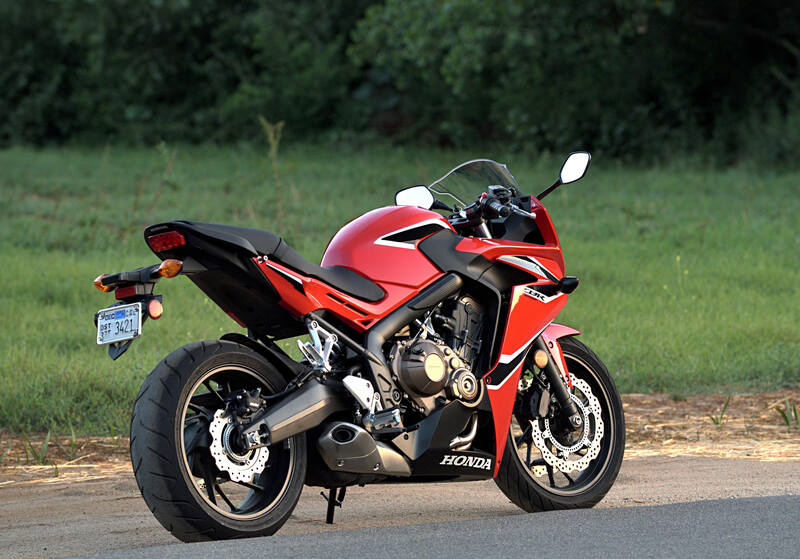 As mentioned before, the CBR650F was not intended to be a scalpel-sharp supersport bike, so overall handling is several notches slower, with steering requiring more effort than a front-line 600. The term “nimble” isn’t in this Honda’s playbook, but the payoff is that it remains unflustered over the nastiest pavement imperfections, with the suspension doing an admirable job of absorbing the vast majority of bumps. Which brings us back to the SDBV fork. We were very impressed with its ability to absorb big sharp-edged bumps and small rolling bumps under braking with equal aplomb, especially considering the fork’s non-adjustability. Speaking of braking, the SDBV fork also did an excellent job of preventing excessive front end dive when you grabbed the front brake aggressively, an impressive aspect when you take into account the soft comfort-biased suspension rates, as well as the good stopping power afforded by the dual 320mm discs up front. Even with the budget-minded, slide-pin/two-piston calipers (as well as ABS on the model we tested), there’s decent feel and a nice, linear progression to the stopping power as you pull on the lever harder. Should you decide to venture into the canyons or country backroads with the CBR650F, you’ll find it to be a willing and able partner—provided you keep the aggression under control. There’s plenty of ground clearance despite the decent legroom, the engine’s midrange punch provides plenty of smiles, and the bike’s stability over rough patches inspires confidence. The OEM-specific Dunlop D222 “M” version tires (the M designating they are specifically for the Honda) provide good traction and handling, but they give you the first sign that you’re pushing a little too hard when the rear starts to spin up or slide at deeper lean angles. The Honda’s less-than-nimble handling also means that steering inputs need to become more aggressive, and that quickly starts to overwhelm the soft suspension rates and get more than the peg feelers to touch down. But again, you’re probably on the wrong bike if you’re riding that hard, and the CBR safely lets you know you are approaching its limitations without biting you. 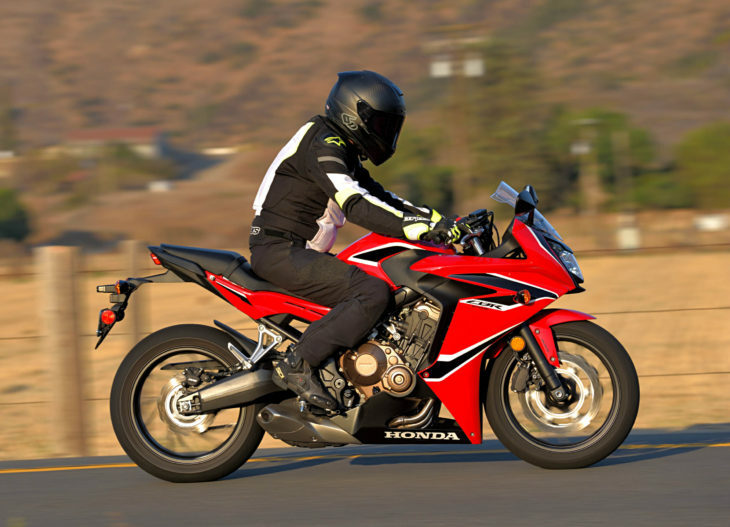 Part of that limitation with the Honda’s handling could also be attributed to its weight; at a claimed curb weight (all fluids plus full fuel tank) of 461 pounds, the CBR650F is carrying about 40 or so extra pounds compared to a 600 supersport. You can certainly feel that heft when flinging the bike around, as well as when pushing it around a parking lot. The Honda’s comfy ergos and frugal engine (we averaged around 45 mpg with a lot of throttle twisting, meaning you could easily get 200 miles to a tankful with a less-heavy right wrist) encourage longer rides, but the vibration from the inline four-cylinder gets buzzy in the bars and footpegs once past 4500 rpm. 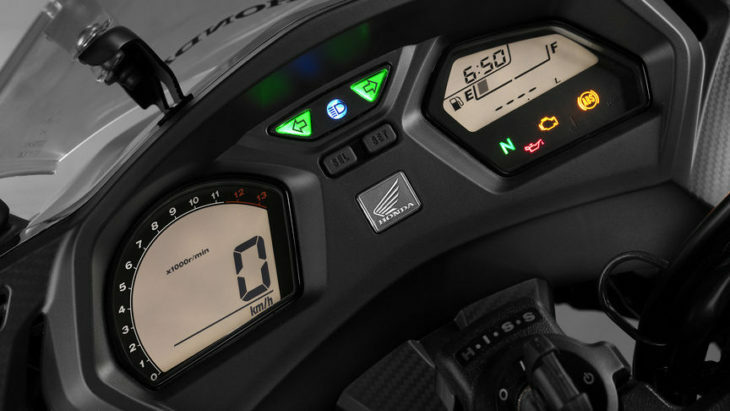 We also found it curious why there was no gear indicator on the instrument panel; while not an absolutely essential feature, we’ve become so accustomed to its inclusion on the vast majority of other motorcycles that its absence was noticeable. And the usage of the same handlebar switchgear from the VFR1200 that has the horn button in the spot where the turn signal switch usually resides (even BMW has since dropped that peculiar setup) proved incredibly annoying. 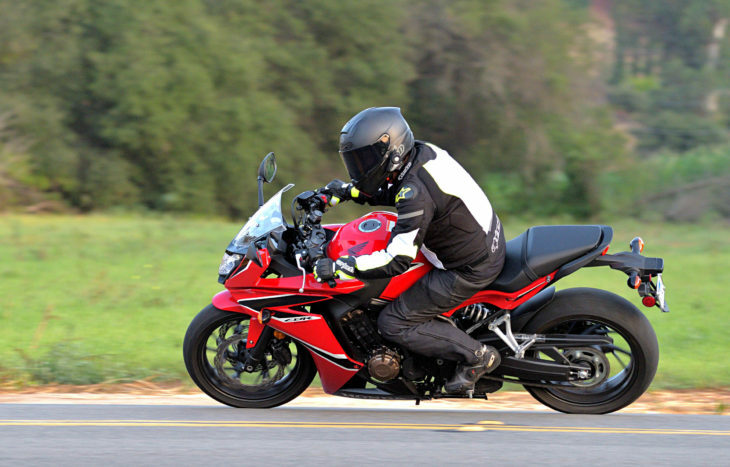 Those nitpicks aside, the Honda CBR650F has a lot of appeal for someone who’s more interested in a middleweight bike’s do-it-all capabilities than outright performance. While it wouldn’t be my first choice (there are several bikes with considerably cheaper sticker prices and better bang for the buck in my mind, such as Yamaha’s MT-07 or Suzuki’s SV650), the Honda has plenty of attributes that make it deserving of consideration if I were a novice rider looking for a middleweight daily rider. What Gear is the rider wearing for the review? Thanks!!!! Doesn’t do anything that the old F2 and F3 didn’t do back in the day. They delivered mid range plus a useful top end combined with comfortable ergonomics. Nice looking bike for sure. But I’ll probably opt for the Harley Davidson, now that I know they are using Japanese parts. Is this something they started doing recently? I wonder if any other companies source parts from other countries? Thanks to Motorcycle Daily for keeping me informed ! Harley has been using Japanese forks (showa), instruments (nippon)and carburetors (keihin) since the mid 90’s, maybe earlier. They are also using a lot of Chinese and Vietnamese made plastic parts these days. They haven’t been 100% made in America for decades. Wheels are made in Taiwan. There are all sorts of globally sourced parts on Harleys, it’s just tightly guarded info. I wonder about the continued existence of mid sized four cylinder engines in bikes that are not the racer replica rigs. I guess I can understand using a old design and tooling to produce a cheaper sporty sibling tuned for easier every day use. But with all the great twins there are either on the market or in the works, why even bother to make a new 80-90hp four cylinder anymore? The writer of the article (Why doesn’t this site credit the writers anymore?) 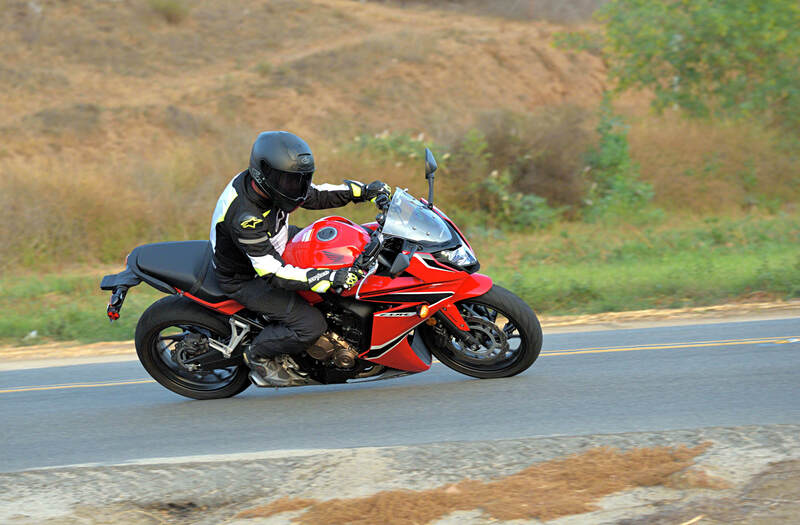 praises the power that the bike makes around 4500rpm but it falls off well before redline. Doesn’t that describe a twin? Then the writer goes on about the four cylinder buzz. Well, if it was a twin or a triple, it wouldn’t have the four cylinder buzz now would it? In the last thirty years the V8 engine has gone from being fairly standard equipment to being wretched excess in the auto industry. In street bikes, the four cylinder engine has been a fairly standard feature since the seventies. But horsepower per liter in four cylinder motorcycle engines has more than doubled since that time. They now represent wretched excess. Or, in the case of a 80-90hp engine, wretched complexity, width and vibration. The writer is credited below the article title. 80 – 90 hp is still a big power advantage over the midsized twins. The problem isn’t the two extra cylinders, IMO. Some fours are very smooth. Some twins are very vibey. The problem I think is just the competitive lanscape in general and Honda’s propensity to ignore it. I suppose the GSX-S750 is the closest rival, though the Suzuki out performs this bike in every way without giving up any streetability. And for less money. Then the midsized twins… That market seems to have decided that fat mid-range power and 70-ish hp is more than enough, and the race turned to saving weight. The Honda doesn’t really fit into that category. It has a fairing with kind ergos. That is kind of a rare thing these days. So maybe Honda is playing the “only game in town” card. Really? There must be something goofy about my browser. I don’t see and credit. I think now that KTM went and did a KTM by producing a 105hp twin. I think that some of the other OEMs and going to up their parallel twin games. They have been selling fairly well and have been unchanged for a while. The KTM has been getting a lot of attention. So I would expect the other parallel twins to start showing up with some bold new horsepower to draw a little attention back to themselves. I remember when Honda first came out with the CB500/4 it was a “baby 750”, a lot of big bike riders fell in love with its smaller/lighter/easier to ride character, I had a 350 and it seemed like a big bike to me. Today, this bike with its performance and specs, so often “bleh” by so many, not a real high hp bike, gets passed up. Unless racing, or long distnce 2 up, this would be a great bike. But, i have too many already. I wonder if those that pass it up, because its too slow, ride a bigger bike wfo all the time? Judging by the popularity of the KTM 390 and Ninja 400, people — as always — want cool stuff with good value. The Honda is pretty cool, but lacks value. I love smooth 4s that are engineered for torque between 6 and 9k RPM. The problem here is that the engine isn’t smooth, and a 4 that isn’t smooth puts my hands to sleep in a way that a triple or twin doesn’t. Can Honda get together with Suzuki and place the great engine from the too-heavy GSX-650f in the beautiful, relatively light CB-650f? It is an attractive bike for sure, but man it seems expensive for what you get in this day and age. Vibration is a pretty personal nuisance, and what one rider considers unbearable may go completely unnoticed by another. I haven’t ridden the bike, so I don’t know. But it is disappointing to hear that it gets buzzy at just 4500 rpms, especially considering that every other possible performance concession has been made in order to deliver a machine that is street friendly above all. Why not get the counter balancing right? Especially for this kind of money? I guess if you want a faired bike with street friendly ergos, it is one of the few games in town. It’s not a mystery why this Honda has never been a big seller in the US. There are so many bikes available that do well in one area that speaks to a riders heart. 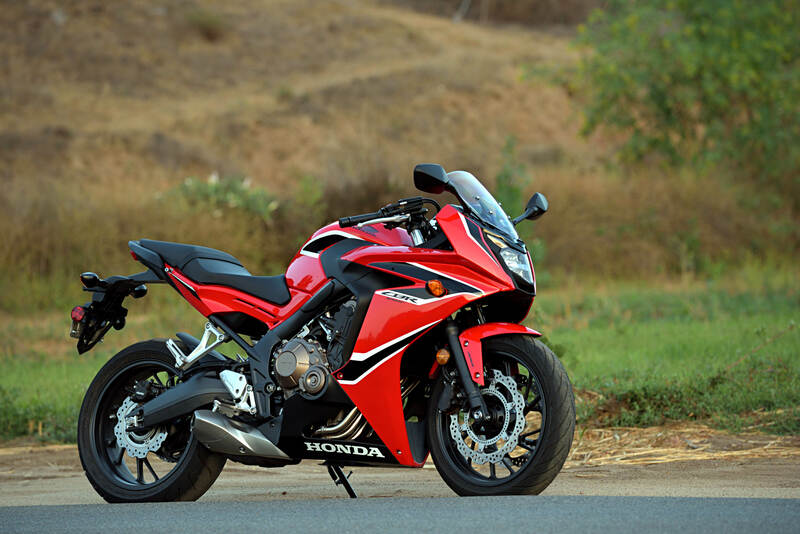 The CBR650F tries to satisfy every area without performing exceedingly well in any one area. It’s not the fastest, no good for exploring off-road, not the smoothest, not the simplest (mechanically), not the best tourer etc. It is mostly built as a compromise by being OK in many areas but not impressing the average rider looking a unique machine. It’s basically you’re bland HONDA offering. Who wants to ride a bland motorcycle when you can ride an ADV bike, Supersport, dedicated tourer or torquey triple? No, this is an expensive beginner bike that won’t scare the cr@p out of you. It will always be the HONDA that is trying to impress but being largely ignored by the riding public. I’ve always wanted to like this bike because I like the idea of a rideable, comfortable 600 sport bike but it has never done it for me. The styling’s a bit too angular; it doesn’t “flow” enough. And the engine needs 100 hp. Basically what Honda should have done is make a Kawasaki ZZR600 with EFI. This is why I am keeping my 2003 VFR…..forever!!!! My 98 still keeps the smiles flowing. And the song of the engine…so nice. The only Honda that hasn’t flown under the radar for years is the Africa Twin. Well I suppose the new Wing too, if that counts. For better or for worse Honda’s do not excite enthusiasts. I always say that Honda builds the bikes they think you should want, as opposed to bikes that people do want. What is Honda’s rank in motorcycle sales volume? Does anyone have a clue? They can’t possibly be #1 anymore is my guess. FWIW, the current generation 450 mx/off-road line-up (2017->) had big hype, has been very well received, and sells great. So Honda still has the capacity to make bikes that excite the hard-core rider. Hopefully this translates to the street market also. I believe Honda is still, and by a large degree, the largest manufacturer of bikes in the world. I think it’s rather easy to get caught up in the US market which doesn’t always reflect what goes on elsewhere. Saying that, I think Honda still is big in the US, just may not have what you want? The 500s are deservedly doing very well, especially the cb500x. The grom is a cult favorite, with the Monkey coming soon. The goldwing has received a lot of press. and the fireblade is very well regarded. It kind of depends on your radar settings. Sounds like a jack-of-all-trades, master of none. So, is that good or bad? So the 650 actually has less torque than the 600 (46 vs 49) but I think it’s just misconception. The CBR600RR has more rev range/power band which means you can keep it in lower gears longer for better acceleration. The 650 will need to shift sooner so you start losing gearing advantage (the whole reason they lowered the overall gearing on this bike – to get some of that acceleration back). Go ahead and try to drag race against a 600, just don’t bet your pink. Or, it’s not a race bike, it’s a street bike for riders who don’t let a spec sheet define their riding experience. Imagine that! It’s always been that way with bikes though. The biggest yardstick applied is one of acceleration. I see the riding experience a bit wider than that myself. To each their own. Don’t get me wrong, pretty much every bike I’ve owned has been considered “slow”. I don’t really care. What gets me though is that people wrongly assume that “tuned for torque” means better acceleration. On the contrary, increasing torque at the expense of power makes a bike slower to accelerate as power (over mass) is what determines your rate of acceleration. I’m more reacting to the misunderstanding of physics in much the same way in which someone might understand the correct use of grammar but not bother to apply it. Todd, I don’t think of “Tuned for torque” meaning better acceleration necessarily. If comparing two or more engines I expect the TFT motor to possess a motor that’s more tractable, especially at lower rpm’s, compared to more highly tuned bikes. In that regard making them easier to start out from a stop possibly and needing fewer gear changes to reach its max potential. That max potential just may be lower than a more highly tuned one. Who is making that assumption? I think everyone understands better power at a more usable rev range, allowing for stronger acceleration at rpm settings that are ridden more often. There is a comment about the quality of power in the article (good acceleration @4500rpm, passing power below 7000rpm). Nobody is under the illusion that this bike is faster than a 600cc SS. One situation riding with my younger brother illustrates the point. We were both riding Honda 350s, me on an XL350, him on a CB350. Over the course of a long mountain road, I left my brother way behind. I went back to find him at the side of the road, nursing an aching gearshift foot. He had been constantly shifting gears, trying to find enough power to keep up with me. I told him I only changed gear five times over twenty miles. My lighter bike with greater cornering clearance was also a factor (though I’m heavier than my brother). The point being my bike had a wider, flatter power band that was just so much easier to use on a curving road (and why would you ride any other?). Handlebar vibration that easily numbs the hands is terrible and at this stage of development shouldn’t exist. Vibration @ 4,500 and up means it won’t be a good Freeway, Interstate or high speed commuter bike since the average and legal speed in the heartland is 75 to 85 mph. The ergonomics are just right for Midgets and Jockeys and the typical Asian. What happened to comfort HONDA? Have you tested one yet? I guess you’re not “Asian” (Russian?) but it looks pretty neutral to me with not much of the racer crouch you find in sport bikes. I’m not sure about the vibration issue either: I have a friend with a CBR650, has done 35,000 miles in the 2 years he’s owned it. He’s never mentioned the issue at all. I have the naked version, there’s some vibration specially when decelerating but it’s worse on the brake and clutch levers – since I usually cover them when riding it’s a bit annoying. Handlebars and footpegs not so much but I usually wear gloves and boots and vibration is felt differently for different people. Used prices are attractive compared to the competition in my country and apart from ABS has no expensive (and failure-prone) technology, I’m pretty happy with it (oh the inline four song) and if you’re looking for a road going motorcycle I’d suggest at least taking a test ride. This motor is the direct opposite of sewing machine smooth. It is very harsh at all revs, not just over 4500. The naked version has a weird riding position, the set up is clearly intended for the faired version. If you note the riders legs in the pictures are very folded up and pegs rear set. Now sit up straight as per the naked, and it all goes very uncomfortable. In Australia, we now only get the 35KW learner model. I sells very poorly because for the same 35KW, the Buyer can get a CBR500F or CB500 with a lot less weight, same fuel economy, and several thousand Dollars cheaper. This full power version did not take off as the FJ/MT 07& 9 just blitzed it for value due to typical Honda Royce overpricing. I was really tempted by this bike last time I was shopping. I found a Z800 for cheaper than any of the CBR650’s in my area and got more motor, brakes, and suspension than the Honda offers for less money. The Z900 is even better but might be a lot of bike if you’re inexperienced. I think you have to really value the Honda brand or feel you’re not ready for 100+ hp to chose this one over the competition, particularly considering cost. Well-stated, John. Seems like many of us still hope that Honda or Yamaha listens to us. We want a 750-900cc triple, sport-touring style (like a smaller FJR) 100+ HP and sub 500 lbs. I think they’d sell a ton of them! You mean like the Yamaha FJ-09/Tracer…? Sounds like he means something more along the lines of the Ducati Supersport. The Tracer has everything but the traditional sport tourer look. No, sorry, exactly NOT like a FJ-09 Tracer. The Tracer has a stupid-tall seat, brought about by that faux-ADV look – because it ISN’T an ADV – and mediocre to poor wind & weather protection (for a “sport tourer”). We ASKED Yamaha for a sport-tourer. Instead they gave us…that thing. And had at *least* 947 of them left over at the end of the first season (which is probably close to 50% of the shipment), for that was the number of FJ-09’s still listed for sale as of that December on CycleTrader. It isn’t what the target demographic asked for, and frankly we don’t want it. Yamaha has had exactly what you are describing for a few years now, the FJ-09, and just updated to the Tracer 900 GT. Everyone should have come up with something other than “sport tourer” to describe the ADV-style bikes. If the class is to die, fine, but don’t mutate into something else while calling it the same thing. TimC, I agree totally. I never thought of the FJ-09 or Tracer as a “sport tourer”. I hope one of the manufacturers comes through. I bought a 2015 FJ-09 in spite of not being a fan of its looks, and it has won me over by being such a great bike (and from certain angles it looks better). It makes an excellent lightweight sport tourer, I just returned from a trip across Oregon, Idaho, Nevada, and other than the hard seat, there’s nothing that wasn’t perfect about the bike. What it’s definitely not is an “adventure bike,” its 100% for the street. The 471cc isn’t great for it’s size. Adding 30% isn’t going to make it a great engine, either. What disadvantages do you refer to? Too small fairing? This engine sounds spectacular for the street, torquey, smooth, efficient, everything a 600cc SS engine isn’t. The riding position looks super comfy and it weighs 461lb wet. Like others have said, if you don’t already own a Fj-09, then you don’t really want the bike that you say you do. Dave, you are right. I love the Tracer specs. My 2 main issues are styling and seat height. Like I stated above – might just change my mind here soon. All the reviews are stellar. I’m not the OP, but I want a smaller FJR-like bike also. No, I don’t own an FJ09, because it falls short in one key area, load capacity. On the FJ09, it’s only around 360#. Just fine for me and my 215# body, plus gear and luggage. The problem is my wife loves to ride with me, and with gear that’s another 160#, so we’ll blow right past that load limit. Most other “mid sized” (I guess we have to call anything up to 1000cc mid sized these days) sport touring bikes have absurdly cramped passenger accommodations and/or similarly limited load capacity (looking at you, Interceptor and Ninja 1000). Only the Versys 1000 gets it right, but unfortunately it looks like a Versys 1000. I’d love an FJR 1300, but it’s overkill for 90% of my riding and a bit beyond my budge. SausageCreature – you nailed it my friend! I ride a used (there are plenty available) FJR1300 and love it for 2-up trips with my wife. I really need and want lighter these days. The FJ09 is simply too big. The FJ07 would be perfect if it ever shows. Better engine, better seat, better rising position than the Honda. Honda just thinks people will buy most anything they build at any price, as long as it’s boring. Then they make something too boring.